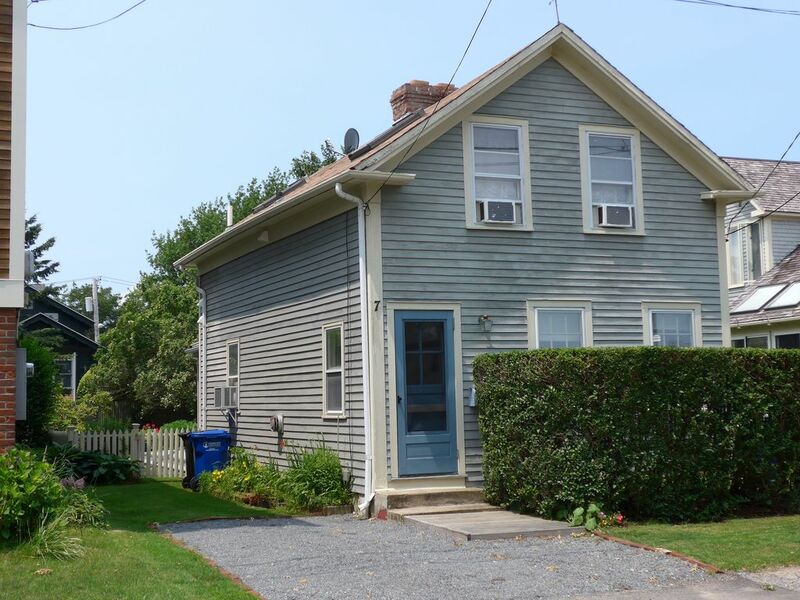 #7 is a welcoming, comfortable, and conveniently located cottage in first block from Newport Harbor, off Wellington Ave. [Home of Ida Lewis + New York Yacht Clubs]. Has small back yard [maintained by owners] and has ‘spacious’ feel with Spencer Park directly opposite / facing #7. [Houses on only one side of Clinton St] 1890's Cottage, which was fully renovated in the 80’s. Re-painted & re-furbished in 2009, continuously maintained, and we always freshen up with touch up paint etc before each summer season. For the 2018 season we have refinished the custom wood counter tops in the Kitchen. There are finished wood floors and carpets throughout. Lovely bright upstairs w/ skylights. Window Air-cons for Summer comfort. Fully furnished and the kitchen is well equipped, just bring your suitcase! [please see photos for representation of items provided in cabinets, drawers and closets] Sleeps four w/ pullout couch for occasional guests. There is a Master bedroom suite, queen bed with separate sitting room. The washer & dryer are in a separate little room, off the master bedroom sitting room, and has an extra vanity sink for convenience. The second bedroom has two single beds. Both bedrooms have tvs. The wooden deck on back of house was extended for the 2013 Season, and has table and chairs, Gas Bar b q grill, umbrella & sun chairs. In 2016 we added a wooden counter with storage under for beach chairs. We consider pets on an individual basis, please check with me about your pet. Our monthly rates change with the seasons, so please contact me for details of the dates you are considering. Wonderful location for harbor-front walks in King Park, located at the end of Clinton St. Enjoy spectacular Sunset views across harbor to Fort Adams and Newport Bridge. The house is within easy walking distance [2 Blocks] to Lower Thames St. w/ Restaurants, Shopping, Banks and ATM’s. Bicycle rides around Ocean Drive and to beaches. 45mins from Providence Green Airport & Kingston RI Train station. Approx 1hr 45min to Boston Ma. Fort Adams State Park, located on Newport Harbor, is a 10 mins bike ride away from #7 Clinton St. If you enjoy walking ...: #7 is well situated to walk either into town or along the harbor on Wellington Ave. and King Park. There are many varied Restaurants [Family to Gourmet], shops, Pottery and Glass Blowing Studio/retail stores, and ATMs - all within a few blocks. In town there are many small art galleries showing varied work by local artists, and also photographic image galleries. Grocery delivery possible from a local supermarket. There is no necessity for a car most days! Bicycle rentals are available, and it is also a great way to get around town and to the beach. Walking along Newport's famous Cliff Walk is a wonderful experience, with Views of Easton's Beach, the Atlantic Ocean along the coastline, and several of Newport's famous mansions. There are several wildlife reserves in nearby Middletown RI, [15min drive] with walking trails. Such as the Norman Bird Sanctuary and Sachuest Point Wild life Refuge. Sports such as Sailing, Fishing, Kayaking, Bicycling, Golf, Tennis, Surfing are popular pastimes on the island. There is so much to do in Newport and on Aquidneck Island! 'Sail Newport', located in Fort Adams State Park, offers Sailing schools for kids [and older], and small sail boat rentals. Harbor Tours, Charters on Classic 12 meter America's Cup sail boats. Fishing charters. Ocean Fly fishing instruction. Surf board, Kayak and small boat rentals. Tall Ships make visits to the Newport Harbor from time to time. Many Sailing Racing Series held throughout the Summer, good viewing from Fort Adams Park. Aquidneck Island is popular in the surfing world for its wave action! Newport is fun for bicyclists, from getting around town on busy traffic days, to peddling around viewing the mansions, and historic architecture. Not to be missed - cycling around the approx ten mile Ocean Drive, with spectacular ocean views, and pond wild life. Live music - Festivals, concerts and more: Newport offers many varied entertainment possibilities. Jazz and Folk Festivals at Fort Adams in Aug.
Two weeks of Classical Chamber Music concerts in July. Many bars and restaurants offer live music. The local Newport Art Museum offers art workshops for adults teens and kids , and has Camps for kids. I have lived in Newport since 1974, and have loved my time here. Newport is a wonderful town to live in, and has so much to offer visitors and residents alike. We bought and completely renovated this house, and then lived in in it for 8 years because we loved the location. We then bought the house next door, completely renovated it and moved in because we still love the location! We have rented #7 Clinton St ever since moving out. The location of the house is close enough to town to walk to shops and restaurants within a few blocks. It is close to the harbour, and one can enjoy sunset walks with views over the water across the harbour to the Newport Pell Bridge. Spencer Park, the park opposite the house, gives a very spacious feeling to living here. The neighbourhood is friendly and pretty quiet. Full Bathroom is upstairs. 1/2 Bath is downstairs. Our cottage at #7 Clinton St is only about 500 ft to the Newport Harbor wall, and about 1.5 miles to Gooseberry Beach on Ocean Ave. Plenty of towels of ranging sizes. Plus beach towels. Small back lawn and garden, maintained by owners. Wooden deck with table, chairs , and sun umbrella. Several locations offer water sport gear rentals and sales. Surf boards, paddle boards and Wind surfing. There are several public courts available in town. One can join the Tennis Hall of Fame on Bellevue Ave. There are three Golf Courses which are open to the public on the island [Aquidneck Island], and several closeby on the mainland. There is a small garden/yard in the back of the house. Lawn care and garden maintenance included in rental rate. Clients with approved pets are responsible for 'poop scooping'! Exceptionally clean, large home in a fabulous location - we walked to everything. It is located 3 houses from a harbor where they have free music on Saturdays. Kitchen has more than ample accessories, pots. silver, etc - everything you need. The yard is beautiful, with patio set and barbeque. The stairway to the bedrooms, can be a bit tricky in the beginning, but you get used to it. Biddy and Ed are excellent hosts. The house is supplied with everything you need - loved that the washer/dryer were on the upper floor. The in window air conditioners kept us very cool. No worries when you rent this house! Many thanks Karen for taking the time, and writing such a great review for our house. We are so pleased they enjoyed our house and its location. They were great tenants, and it was a real pleasure to meet them. Fantastic house, and the owners are super helpful! I stayed here for a month while in school and had no problems. The house is great and if you ever need anything Biddy will help you out, I highly recommend it. It is so great to receive such a good review, from a great tenant. We are very thankful, and really appreciate when people take the time out of busy schedules to write something. I cannot say enough about this property and its wonderful owners. First, the photos do not do it justice. The house is larger (and more lovely) than it appears from the street or online and is immaculately maintained. Each room is full of charm and considerate touches that made us feel welcome from the moment we arrived and throughout our month-long stay. With an abundance of linens, kitchen utensils, home supplies, books, beach chairs, and even power strips at just about every outlet...these are hosts who clearly care about the comfort of their guests. The garden behind the house is absolutely beautiful and provides the perfect respite after a day exploring Newport. The house is three doors down from a terrific harbor-front park that delivers amazing views and spectacular sunsets. Just about all of Newport's attractions are within walking distance and the house comes with off-street parking (which anyone who spends time in Newport can tell you is very, very good to have.) Thank you, Biddy and Ed for your splendid hospitality. I hope we have the good fortune to be with you again soon. We are so very grateful to Denise for writing such a wonderful review of our house. She, with her husband and son, were the best of tenants, we would welcome them back anytime! It is great to know our efforts to provide a welcoming and comfortable home for our clients worked for them. Thank you Denise, for writing such nice things about your stay at #7 Clinton St.
A really lovely stay. Fantastic owners who obviously take pride in this property and were incredibly accommodating of us and our two very small children. Incredibly clean, well stocked home. Very close to the main shopping street, bars and restaurants right in the heart of the town whilst feeling the open air of the park just across the road. A perfect little garden out back with deck and bbq made for lovely evenings in the spring sunlight. Was very sad to leave when the time came and will certainly recommend to anyone wanting a central location in newport. We really enjoyed meeting this lovely young Family. They were great tenants. We are very happy that they enjoyed their time in our house, and we are very grateful that they were willing to write such a great review. Excited to return for our fourth summer! My husband and I have rented this wonderful cottage for a month for the past three summers--this summer will make our fourth. Where do I begin? The house is the perfect getaway--close to the water, a stone's throw to the restaurants and shops of Thames Street, offers off-street parking...everything you could possibly need to make your time in Newport special. It's located exactly where you'd want to be if visiting. The interior of the house and charming and cozy. We typically have guests every weekend...and they are always dying to return the next summer! Both bedrooms are lovely, and we've had an extra guest during a weekend visit who was able to stay on the pull-out couch in the living room. The backyard is impeccably maintained, and we try to enjoy our meals on the deck as much as possible to enjoy Biddy's lovely gardens. My husband and I can't imagine a summer without a month in our special place in Newport. I can't say enough about the house, and we count down the weeks to our time there each year. Many thanks to Kate for her great review. We really enjoyed seeing them for so many years in a row. We were so pleased to meet their baby daughter in 2014. A lovely family, and really great tenants! This is a great rental house. It is clean, comfortable and well-stocked with everything that you would need. The house is well located, walking distance to down town shopping, and grocery stores near-by. Biking distance or short drive to all the local beaches. It has a lovely backyard with flowers, a bench under a shade tree for reading and relaxation, barbecue and outdoor dining area. Biddy and Ed are friendly but not at all intrusive. They responded very promptly to any request we had such as changing the gas for the grill when it was empty. Really lovely people. We'd highly recommend this rental. We hope that all our future clients will be equally as happy with what the house offers, as Anne and her Family. We do make an effort to keep all appliances and furnishings etc in good working order, and fresh paint inside and out whenever necessary. We are happy to respond to any inquiry and request for any details from all prospective clients. It is great for us to have clients review our vacation property. We are very grateful to Anne for taking the time. Newport has a multitude of attractions for visitors with very diverse interests. There are many historic buildings ranging from Mansions to small houses lovingly restored. Art museums and galleries, local Pottery and Glass Blowing to view. It offers opportunities for sailing and many other varied water sports such as surfing, kayaking and fishing. There are golf courses on the island, shopping, restaurants, walking tours, wildlife reserves, museums, ship building and restoration. Music festivals from Jazz to Classical during the summer. Newport is the home of the International Tennis Hall of Fame on Bellevue Ave, which runs tournaments in the summer. Whatever the weather there is always something to do here! Other Activities: There are wildlife sanctuaries with walking trails, kayak and surf board rentals, canoeing on ponds, pleasure boating. An exciting event this year will be the America's Cup yacht race trials - ten days of racing 23rd June - 1st July 2012. The race courses will be easily watched from shore, from Fort Adam's State Park. Golf: There are several public or private/public golf courses on the Island, Newport National Golf Course, Montaup Golf Course, Green Valley Golf Course, and a public 9 Hole on Jamestown, just minutes over the Newport Bridge. All within 5 - 12 mls of #7 Clinton St.
$500 Refundable Sec. Deposit for individual months. $1000 Refundable Sec. Deposit for multiple months. Cleaning fee $100 for one month rental. With pets, additional fee possible Cancellation policy information available for prospective clients.